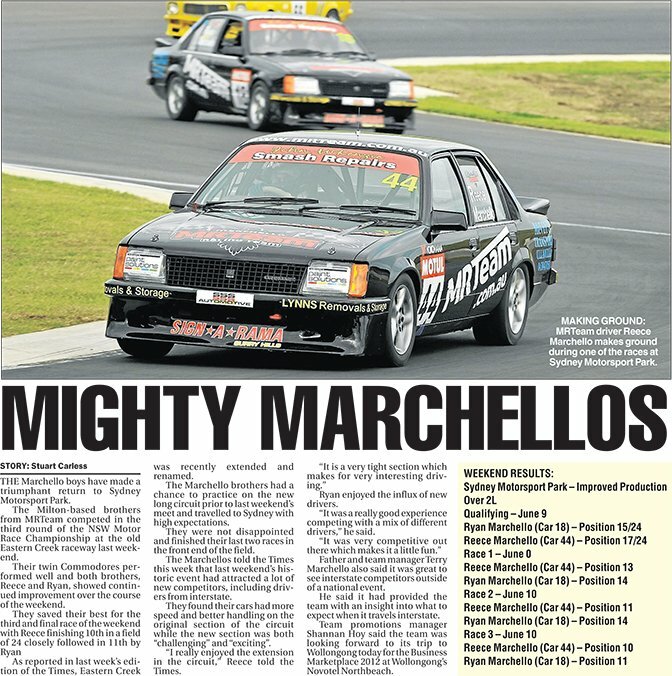 THE Marchello boys have made a triumphant return to Sydney Motorsport Park. The Milton-based brothers from MRTeam competed in the third round of the NSW Motor Race Championship at the old Eastern Creek raceway last weekend. Their twin Commodores performed well and both brothers, Reece and Ryan, showed continued improvement over the course of the weekend. As reported in last week's edition of the Times, Eastern Creek was recently extended and renamed. The Marchello brothers had a chance to practice on the new long circuit prior to last weekend's meet and travelled to Sydney with high expectations. They were not disappointed and finished their last two races in the front end of the field. The Marchellos told the Times this week that last weekend's historic event had attracted a lot of new competitors, including drivers from interstate. They found their cars had more speed and better handling on the original section of the circuit while the new section was both "challenging" and "exciting". "I really enjoyed the extension in the circuit," Reece told the Times. "It is a very tight section which makes for very interesting driving." Ryan enjoyed the influx of new drivers. "It was a really good experience competing with a mix of different drivers," he said. "It was very competitive out there which makes it a little fun." Father and team manager Terry Marchello also said it was great to see interstate competitors outside of a national event. He said it had provided the team with an insight into what to expect when it travels interstate. Team promotions manager Shannan Hoy said the team was looking forward to its trip to Wollongong today for the Business Marketplace 2012 at Wollongong's Novotel Northbeach.